I thought I’d try and make a list of all the songs The Black Keys have covered. But more interestingly document those songs with a live or video version of these cover songs. 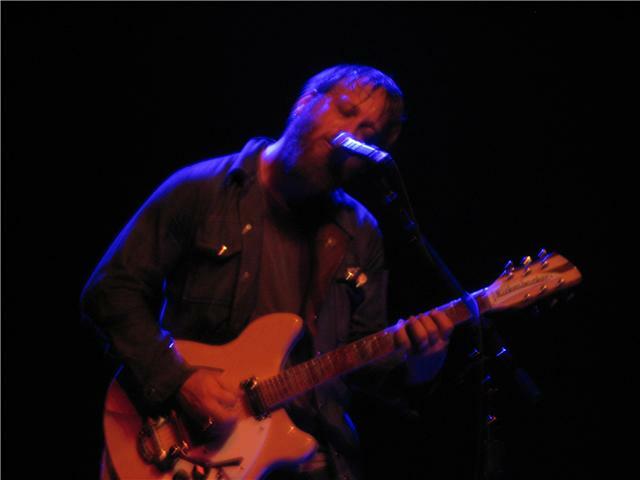 Some of the cover songs are The Black Keys best known tunes. I found a live/video version for all songs except one. I didn’t want to add a song in with someone putting a slideshow or their own video over the top, but the video for Bob Dylan’s The Wicked Messenger cover was the only one I could find and the girl dancing is simply hilarious. There are some Chulahoma and rarities that I haven’t been able to track down, so the list is only a little bit incomplete. Update: I have finally done an interview with Pat Carney from The Black Keys. Read Part 1 and Part 2 of the interview here. Happy days. In anticipation of (hopefully) doing an interview with the Black Keys when they make it to Australia, I thought I’d start a list of possible questions. I’ll continue adding to this list in the weeks ahead. Feel free to leave a comment with a question(s) you’d like to ask so they can be added to the list. Annoyingly (for me at least), fans are always beholden to music journalists or radio/tv hosts for insights but they invariably aren’t the biggest fans of the band or are just interested in idle chatter about nothing much except Dan and Pat’s interest in fast food. Here’s a chance to ask some (mainly) music oriented questions – the music after all is why we all love the band and became fans in the first place. Update 6 March 09. Ahh the questions were a bit lame. I’ve got a heap more, but not for publication until I get an interview. 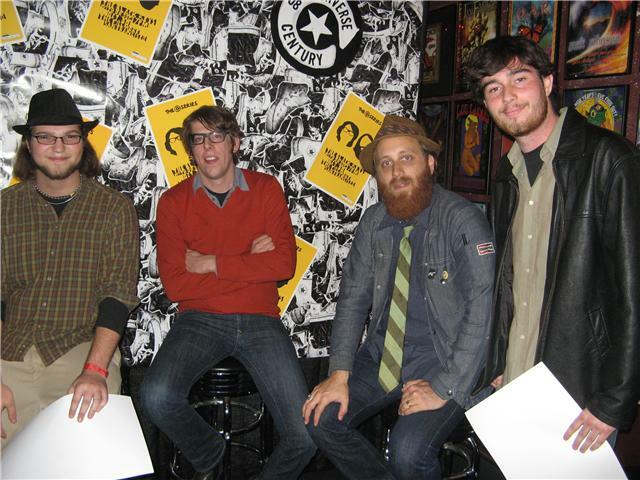 Gavin Murray recently won a double pass in a competition on this website to see The Black Keys and Dr. Dog at the Converse Century Concert Series show in San Francisco on 30 October 2008. Gavin got to meet Dan and Pat before the show. At the show he got a custom poster designed by Converse 1HUND(RED) Artists shoe collaborator Meghan Berckes which was given to all concert-goers. Gavin got his poster signed by Dan and Pat and you can see Pat has done a good job at defacing his likeness on the poster. 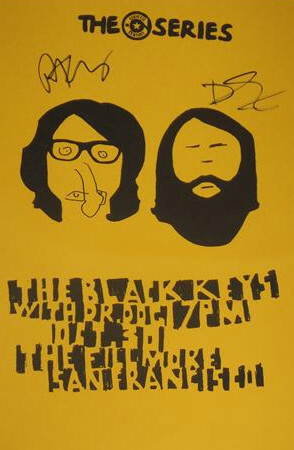 “After the release of Attack and Release, I wasn’t sure what to expect from a Black Keys live performance. Luckily for me, it was the classic two man distortion injected blues I’ve come to know and love, but until now had never had the privilege of seeing in person. Dan and Pat took the stage humbly, as if they didn’t know they possessed the talent and raw rocktastic (its a word, look it up!) abilities to draw in a sold out show to the Fillmore, and with few words commenced the show. Dan’s Rickenbacker beautiful white against his humble attire sounded magnificent through his unique amp set up. 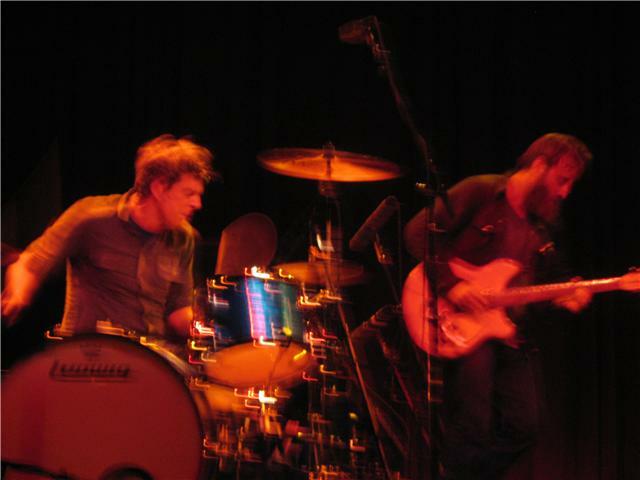 Pat’s furious drumming and Dan’s moaning guitar created the energetic, soulful blues that the band is known for, getting more out of a two man group than many can get out of a trio or even a quartet. It was a treat to see the Black Keys pull off their new songs in the tradition of their earlier albums, Strange Times sounded magnificent, and my personal favorite song from Attack and Release, Psychotic Girl, opened up their encore with an intensity I’d never heard in the song before (I’ll admit a part of me did miss the banjo though.) Their visitations to their old work were astounding, bringing the Sonics’ classic Have Love Will Travel to life and their hit Set You Free to live ferocity as the fans sang along. From beginning to end the show rocked. The opening band, Dr. Dog, held their own as well, creating blues-stomping infused indie-rock sound in the a somewhat soulful folky vain, an apt opening to an amazing show. One thing that could be said about this website is that it is a catalogue of interviews with The Black Keys. We love them, especially those caught on video. Here’s three more you may have missed. The first two are with the usual taciturn Pat at Lollapalooza this year. Both cover recent the recent album production and as usual Pat’s taste in fast food. Maybe I should run a competition to spot the interview where Dan and Pat don’t talk about fast food? The last video interview below features Anthony Kiedis from the Red Hot Chilli Peppers sharing his love for all things Black Keys. Dan is present but more interested in Rick Rubin’s bicycle. Maybe Rick Rubin can find time to produce the next album? Rick Rubin loves hip hop and heavy guitars after all. No doubt it will be discussed when they meet up on the ZZ Top project.